Overview of Abandoned Homes - An overview of abandoned houses scattered throughout Vvardenfell. St. Delyn Waist North-Two - An unoccupied house in the St. Delyn Canton. An Abandoned Shack - A small but cozy fishing shack southwest from Gnaar Mok. 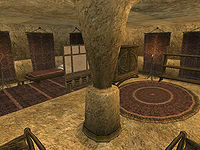 Vori's House - A great house in the beginning, it's located on the market side of Balmora. Hlaalo Manor - A big manor for any time in the game, near Hlaalu Headquarters in Balmora. 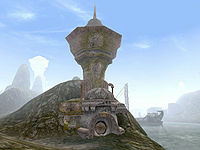 Vacant Tower - A Dwemer Tower to call your own, north of Dagon Fel. Throughout Vvardenfell are abandoned houses that you can use to store stuff in and make it your own. You can usually find these homes in towns but you could also find them out of towns. Description: This is a great house if you want somewhere to keep your stuff. There is also a bed, two shelves, a table, a chest, and a wardrobe in this house. Storage: Lots of storage including sacks, crates and barrels. Description: A small but cozy fishing shack on an island southwest from Gnaar Mok. It has a hammock, table, stool and a little boat outside. It's a great place to take up residence. There's an Exclusive Potion of Shadow and 25 gold hidden in a nearby tree stump, and two more floating barrels behind the shack on the other side of the big rocks. There are also 2 pearls underneath an overturned Bowl on the desk, and 100 gold in a cloth sack behind the hammock, and a few loose gold pieces in between the floorboards. The shack also contains a worn and weathered note and the No-h's Picture Book of Wood. 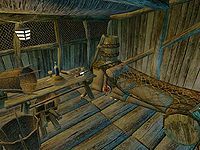 Description: A small shack in Seyda Neen, it has plenty of early storage for holding loot from raiding the local warehouse and other properties. Also includes one hammock, and a small table. Many locked homes are found in Vvardenfell. You must unlock them before you can enter them, but they will most likely have nobody inside, thus letting you store your equipment inside and take a snooze. Be warned, if anybody sees you unlocking the door, then you will be reported to the guards. Description: This is a great house in the beginning, it's located on the market side of Balmora facing the Odai river. It comes with a lock level of 50 and the occupant is out of town. Great Location, access to the Mages, Fighters, and Thieves Guild, Morag Tong, Several Vendors, the Silt Strider, and is just across the river from the local Blades operative. Storage: 1 Chest of drawers on 3rd floor; 6 barrels, 5 sacks, 4 crates, 2 wooden barrels, 2 cloth sacks, Ralen's body, 1 small chest (lock level 65) hidden behind a tapestry at the top of the first set of stairs. Description: The house is decent-sized and has a level 35 lock on the front door and a level 40 lock on the balcony. The only other living occupant of this manor is Ralen's servant, Uryne Nirith, who shouldn't be a problem as you can just lock her in her room. The only other bed here is in the ransacked upstairs room. The middle floor has the balcony door and servant's room. The bottom floor has the deceased Ralen and a bunch of sacks and baskets with plenty of alchemical ingredients. Ralen's body has an infinite weight limit, so stuff him with all your goodies if you are in need of a bank. Occupants: Khargol gro-Boguk and four rats. Description: As the name implies, it is predominately vacant aside from four rats. You can share it with the Orc Khargol gro-Boguk, living in the top half, accessed through a trapdoor. This page was last modified on 9 May 2017, at 03:46.